Certaldo is divided into two parts, a walled city high on the hill called "Rione Castello" or "Certado Alto" and a lower, modern and industrialised part. It is located on the hills that divide the Val d'Elsa from the Val di Pesa, and is well worth a visit. The old town can be reached on foot in 10 minutes or by funicular from the station in the main piazza in 2 minutes. Don't miss the Mercantia street theatre festival in Certaldo! Certaldo was the home of the family of Giovanni Boccaccio, who died and was buried here in 1375. Boccaccio was a man of the Renaissance in almost every sense. His humanism comprised not only classical studies and the attempt to rediscover and reinterpret ancient texts but also the attempt to raise literature in the modern languages to the level of the classical by setting standards for it and then conforming to those standards. Boccaccio advanced further than Petrarch in this direction not only because he sought to dignify prose as well as poetry but also because, in his Ninfale fiesolano, in his Elegia de Madonna Fiammetta, and in the Decameron, he ennobled everyday experience, tragic and comic alike. Although his Teseida and Ninfale d'Ameto invite comparison with classical genres, his Filocolo and Filostrato raised to the level of learned art the literature of chivalry and love that had fallen to the level of the populace. The attention to popular and mediaeval themes that characterised Italian culture in the second half of the 15 C is heavily dependent on the contribution of Boccaccio. 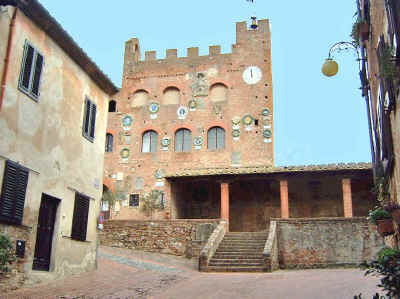 Boccaccio's house in Certaldo is preserved as a small museum and library, the Casa del Boccaccio. 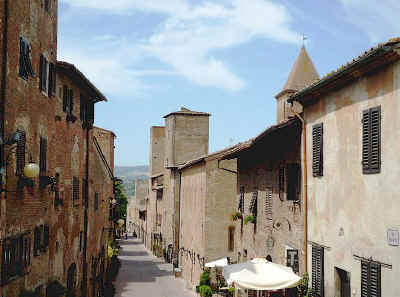 Click here for vacation accommodation and things to see in the Chianti area near Certaldo between Siena and Florence. Certaldo has three museums accessible using a single ticket. They are the museum dedicated to Boccaccio (Casa del Boccaccio), the museum of sacred art and the Palazzo Pretorio, all on via Boccaccio. ● Palazzo Pretorio was originally the castle of the Conti Alberti with its facade is decorated with coats of arms in stone and glazed terracotta that commemorate the governors (vicari) sent from Florence. The keep remains from the original 12 C structure, and the rest dates from the 1400s. Around the courtyard are the rooms where justice was administered, dungeons, and a chapel with a fresco of Doubting Thomas attributed to Benozzo Gozzoli. Several rooms have decorated doorways, fireplaces and remnants of frescoes. ● Palazzo Stiozzi Ridolfi - 13 C with an elegant courtyard and portico. ● Casa del Boccaccio - preserves a few traces of the original mediaeval structure. It was reconstructed in original style after having been more or less totally destroyed by Allied bombing during the Second World War. ● Ss. Jacopo and Filippo - a convent complex with a small brick church from the 1200s. Vorresti pubblicizzare la tua attività su questo sito web per Certaldo e ricevere traffico in entrata dalla nostra rete di più di 50 portali relativi? Clicca qui per ulteriori dettagli in merito alla nostra soluzione integrata per una presenza su internet piena di successi. Certaldo © ammonet InfoTech 2006 - 20189. All rights reserved.